At least two people have been injured in a crash in northwest suburban Pingree Grove. 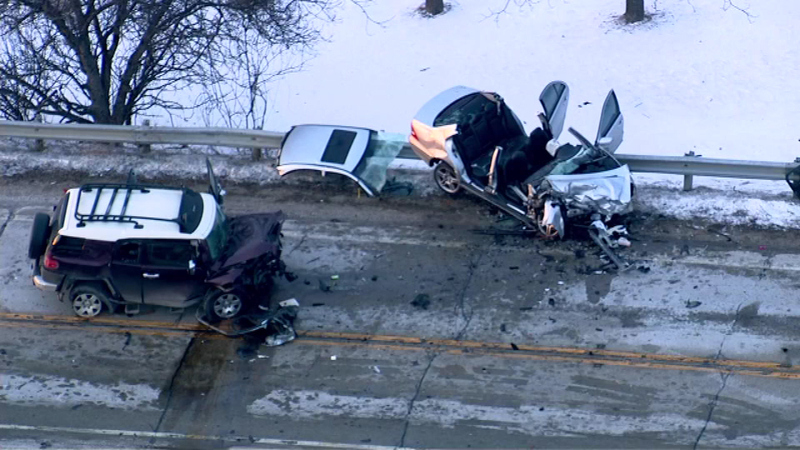 Kane County, Ill. (WLS) -- A 5-year-old girl was killed in three-car crash in unincorporated Rutland Township on Friday. Two others were injured. Gabrielle Horvath, 5, was in a car seat when the Toyota she was riding in was struck head-on by a Mercedes C320 on Route 72 near Big Timber Road, according to the initial report. The Toyota was then struck behind by a Chevy Chrome, the Kane County Sheriff's office said. James Horvath, 45, who was driving the Toyota, is being treated at Sherman Hospital in Elgin, as is the 17-year-old driver of the Mercedes C320. The driver of the Chevy Chrome, David Doyle, 29, of Byron, Ill., was treated at the scene. Police say the investigation continues, but the teenage driver was ticketed for driving in the wrong lane.